Browsing Category: Vines Displaying 1-9 of 9 Found. 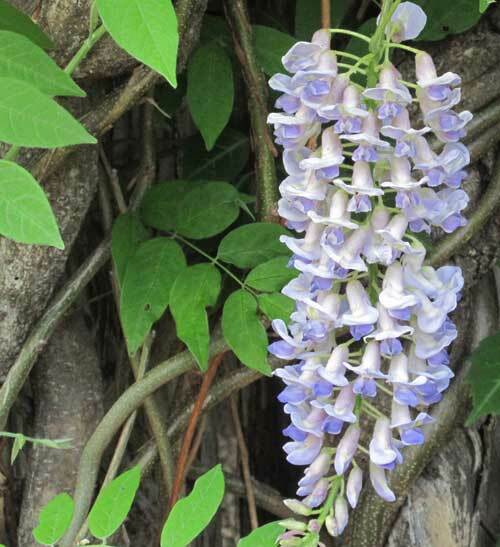 $17.95 This is another selection of an American (native) wisteria vine, the so-called Kentucky wisteria, Wisteria frutescens var macrostachya ’Blue Moon.’ Typing that brings an early recording by Elvis of "Blue Moon of Kentucky" to mind. Perhaps that’s why this selection was so named; I don’t know. I know I was born in Kentucky mid 1940’s so add to the mix. We got our stock plant from the now defunct Rippingale Nursery in Oregon, folks who then were collecting all the wisteria species and cultivars they could find (much like we chased every plant in the species "Hydrangea"). Anyway, it is a native vine that is vigorous but not invasive with a fine light blue flower and faint, subtle fragrance. Needs sun to bloom well. Quite hardy. Zones 5 - 9. $12.95 An excellent, native twining vine introduced many years ago by Cedar Lane Farms in Madison, Georgia. 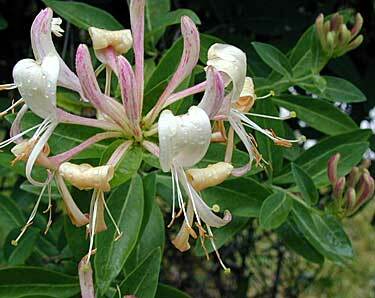 Like all Lonicera sempervirens it is not fragrant, but unlike most this selection is a rebloomer. Produces profuse, deep red flowers in mid-spring and sporadically thereafter through the summer if grown in lots of sun. Easy to have scramble over an arbor or around a statute. Deciduous although in warmer zones during mild winters may be semi-evergreen. Zones 4 - 9. 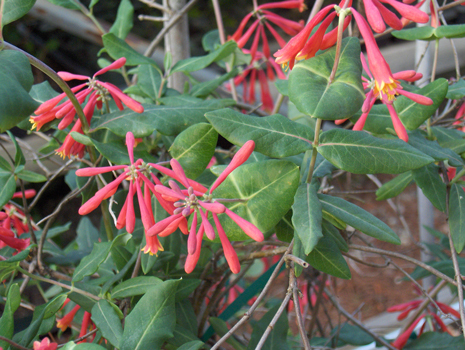 $23.95 Lonicera periclymenum ’Belgica’ is consistently an early-flowering woodbine with deep pink blooms on the outside and creamy yellow within. 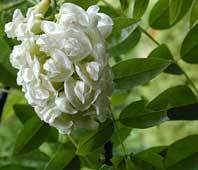 Most fragrant in the evening attracting moths for pollination. This cultivar normally only flowers early in the season (summer). Zones 5 - 9. $19.95 Trachelospermum jasminoides ’Madison’ is an evergreen broadleaf vine that produces intensely fragrant, white star flowers in late spring or early summer. The fragrance is enchanting and made Dr. Dirr remark over lunch years past on a visit to Athens "never did a cheeseburger taste (and smell) so delectable." This clone ’Madison’ is somewhat more cold hardy than the species and was introduced by Jane Symmes at Cedar Lane Farms (in Madison, GA) for which we should all give thanks. 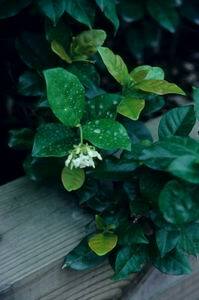 It can be used as a vine or a ground cover. Partial shade is best but it will do in full sun if in a happy site which includes good soil, well drained, out of harsh winds. Zones 7-10. Killed back to roots winter of 2013-2014 when we had a low temperature of -1 degrees. Has re-sprouted and is doing fine. Additional images courtesy of Raulston Arboretum. $26.95 Here’s another wonder we used to grow & hoped to sell, a tiny Chinese wisteria we originally got from Rippingale Nursery (now defunct). 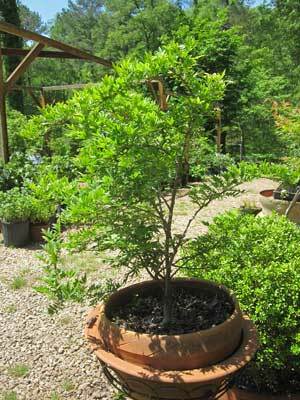 Bonsai enthusiasts always drool over our stock plant and lust to buy it. No deal. 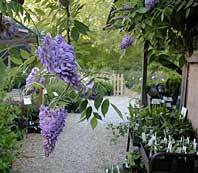 We’ve shared rooted plants with various arboretums and sold a few here in years past. Never blooms or hasn’t for us and hadn’t for Rippingale Nursery so can’t speak to that. These are rooted cuttings from 2017 and are not yet of a size to go in the garden; they will need to be grown on in a container for a season or so. Deciduous for Zones 5 - 8. 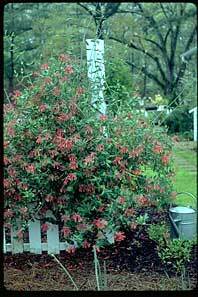 $18.00 The so-called Late Dutch Woodbine honeysuckle, Lonicera periclymenum ’Serotina’, is a twining vine for sun or light shade. It is quite common in the hedgerows and woodlands of Britain and many selections have been made for flower color and/or berry retention. 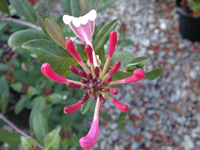 The flowers on this one are dark reddish on the outside with a yellow throat and are strongly fragrant, more definitely in the evening. While vigorous this species is not invasive like Lonicera japonica which has become a noxious weed throughout much of the country. Height to 20 feet. Zones 4 - 8.